The Toronto subway and RT is the main rapid transit (RT) railway system in Toronto, Ontario, Canada. It is run by the Toronto Transit Commission (TTC). Since the first part under Yonge Street opened in 1954 with 12 stations, the system has grown to be Canada's biggest rapid transit rail system. It has four lines and 69 stations on 68.3 km of track. The subway system is used very often and has the most number of passengers of any system in Canada. It has an average of 948,100 passenger trips each weekday (as of 2010). The system is was made bigger on the western part of the Yonge–University Line with new tracks and stations being made north to York University, Steeles Avenue, and Vaughan Corporate Centre in York Region. The Government of Ontario said on March 23, 2006 that it will give $670 million for this new work, which is less than one-third of the total money needed. The new track is about 8.6 km long and was built with six new stations: Downsview Park, Finch West, York University, Pioneer Village, Highway 407, and the Vaughan Metropolitan Centre. It was expected to cost about $2 billion. The first part of the subway, replaced a very busy streetcar route, and followed Yonge Street from Eglinton Avenue south to Front Street, then turned west for one block to end at Bay Street, next to the city's main railway station Union Station and so the subway station was also called Union. This line was finished in 1954 and was 7.4 km long. In 1963 another part was added, that went north from Union station, below University Avenue and Queen's Park to near Bloor Street, where it turned west to end at St. George and Bloor Streets. The Bloor-Danforth Line opened up in 1966 along Bloor Street and Danforth Avenue from Keele Street to Woodbine Avenue, and was made longer in 1968 to run from Islington Avenue to Warden station at Warden and St. Clair Avenues. The routing of the line across the Don Valley was possible because of a choice made more than forty years before. When the Prince Edward Viaduct was built across the Don River in 1919, its design included twin decks below the road to allow for future rail lines. This made it possible for the subway to cross the Don Valley to Danforth Avenue on the east side. The Yonge-University line was extended north 8.7 km from Eglinton Avenue to Finch Avenue and Yonge in 1973 and 1974. More track (9.9 km) was added to the Yonge-University Line in 1978 when it was extended from St. George and Bloor, north and northwest to Eglinton Avenue and Allen Road, then north along the middle of Allen Road to Wilson Avenue. In October 1976, an arson (a fire set on purpose) destroyed subway cars and damage to Christie station. This caused the closure of the Bloor-Danforth Line for three days, and closed Christie station for some time for repairs. More track was added in 1980 at both ends of the Bloor-Danforth Line. These extensions each added one station, bus bays, and, on the eastern end, room to connect to the Scarborough RT. A Scarborough RT car leaving the Lawrence East station. With six stations on 6.8 km of track, the Scarborough RT is a line built almost all above the ground, and which has no direct tracks that connect to the other lines and uses a different trains. It uses the Intermediate Capacity Transit System (ICTS) trains which are very different from subway trains. The route is fully separate from road traffic and pedestrians, the stations are fully covered, and the trains have many doors that use high platforms. An extra 1.6 km was added to the north end of the Spadina part of the Yonge-University-Spadina Line, adding one station (Downsview), with parking for buses. In August 1995, the TTC had a really bad subway accident in what it calls the Russell Hill accident, on the Yonge-University-Spadina Line south of St. Clair West station. Three women died and 100 people were injured, a few badly. The subway's newest line, Sheppard, opened in 2002. 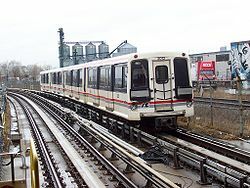 It runs 5.5 km east, under Sheppard Avenue from Sheppard station on the Yonge line (now called Sheppard-Yonge), to Don Mills station at Sheppard and Don Mills Road. The Sheppard line has less users than the other two subway lines, and shorter trains run on it. In its over fifty-year history, the first baby to be born on a TTC subway station platform only occurred recently on February 6, 2006. This incident occurred at Wellesley station and caused delays on the subway system. It was front-page news for many days. An automatic voice system was added to announce each station (such as; "The next station is Bloor, Bloor station.") which ended the need for the train operator to announce each stop. The automated system is used in the whole subway and RT system. Until recently, the TTC did not have plans to expand the subway during the last twenty years but only had plans to build new above-ground rapid transit lines based upon streetcars travelling in closed lanes on streets. Today there are plans to build new subway lines under the ground, including extensions to the Spadina-University line and two lines in the central section of the city south of Bloor-Danforth. Like most subways, the Toronto subway/RT trains get electricity from a third rail that runs next to the tracks. 'Shoes' (pieces of metal that touch the third-rail) mounted on both sides of each coach for contact. Power is supplied at 600 V DC. A train guard opens and closes the subway car doors, and makes sure no one is trapped in a door as the train leaves a station. The train guard tells the driver when it is okay to leave. The car carrying the guard can be identified by the white or the orange light outside the subway car. On weekdays and Saturday, subway service runs from approximately 6:00 am to 1:30 am, but Sunday service begins at 9:00 am. Start times on holidays may vary. For complete lists and details of stations, lines, and their locations in the Toronto subway/RT system, see List of Toronto subway and RT stations. Most stations are named for the nearby road crossed by the line in question. A few are named for major landmarks, such as shopping centres or other transportation stations near the station. All trains stop at every station along their route and run the entire length of their line from end to end. ↑ 1.0 1.1 "2013 TTC Operating Statistics". Toronto Transit Commission. Retrieved 2015-01-14. ↑ "Public Transportation Ridership Report – Fourth Quarter, 2016" (PDF). American Public Transportation Association. March 3, 2017. p. 37. Retrieved 2017-05-15. ↑ "Service Summary January 6 to March 30, 2013" (PDF). Toronto Transit Commission. December 13, 2012. Retrieved 2013-02-10. ↑ "2011 Toronto-York Spadina Subway Extension Overview". Toronto Transit Commission. Retrieved 2013-02-10. ↑ "Scarborough Subway Extension – Initial Business Case" (PDF). City of Toronto. June 2016. p. 1. Retrieved 2017-02-28. ↑ 7.0 7.1 Brown-Bowers, Amy; Isabel Teotonio (February 7, 2006). "Baby born on subway platform". Front Page. Toronto Star. pp. A1. Retrieved 2007-06-21. ↑ Connor, Kevin (2006-02-07). "Baby, what a ride! Child born on subway platform". Toronto Sun. Retrieved 2007-07-21. ↑ Ku, Christina (June 3, 2007). "Our lady of the stations: Meet the calm-voiced woman behind the TTC's automated subway announcements". News. Toronto Star. Retrieved 2007-07-18. ↑ Kalinoswski, Tess (June 16, 2007). "A $17,5B transit promise". The Toronto Star. Retrieved 2007-06-17. Bow, James (2007-06-14). "Toronto's Lost Subway Stations". Transit Toronto. Retrieved 2007-07-21. "Rapid Transit Expansion Study (RTES)" (PDF). TTC. August 2001. "Rapid Transit Expansion Study (RTES) – Follow-Up Report" (PDF). TTC. 2002-06-12. "Spadina Subway Extension". TTC. 2007. This page was last changed on 14 March 2019, at 19:49.